Verso Aprile 2013, oltre a Bosch e Panasonic ci sarà AEG nel mercato delle bici elettriche. Il marchio del gruppo Electrolux ha presentato i suoi sistemi per bici a pedalata assistita all’Eurobike 2012 di Friedrichshafen. Alla fiera A2B ha mostrato la bici Pulse, con integrato il sistema AEG centrale. Uno è posteriore, con coppia da 50Nm e molto silenzioso. Le dimensioni sono ridotte e integra al suo interno il cambio a mozzo oltre ad avere la funzione di recupero energia per ricaricare le batterie ed estendere la portata). L’altro è centrale, ha una coppia da 53Nm e a differenza delle soluzioni Bosch e Panasonic potrà essere montato come kit su bici muscolari visto che non richiede un telaio ad-hoc. Il motore che si presenta come un sottile disco agganciato ai pedali è un 36V da 250W, gearless, e pesa 4,5 kg. Pare molto silenzioso e senza vibrazioni. Il sistema viene completato da una scelta tra batterie da montare sul portapacchi (con portapacchi in dotazione) da 17Ah o nel telaio al posto della borraccia da 11,6Ah (soluzioni analoghe a quelle di Bosch). Il display è un LCD essenziale e resistente alla pioggia da montare al centro del manubrio. Inoltre i comandi sono posizionati sulle manopole ergonomiche, fornite anche loro da AEG. AEG-eBike separates itself firmly from the competition through several unique technical features. The target, to introduce new technologies to the market, was accomplished. Both innovative drive systems (rear and central motor) are completed by two battery variations, which are mounted either at the downtube or the carrier. The set targets during the development were: high quality, functionality, easy handling and comfort. all components were designed and developed in Germany. Producing in Germany allows all important components to carry the label “Made in Germany”. An elaborated service concept, which besides offering seminars, customer service, website (www.aeg-ebike.de) and hotline promises extraordinary service support and will be run directly by AEG-eBike in Germany. The integration of the optically inconspicuous disc motor into an e-bike concept is an absolute world novelty. 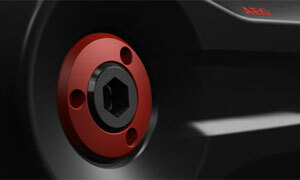 The direct mount onto the bracket shaft allows the system to waive a special frame adapter or an extended wheelbase. The disc motor works without a gear box, which enables the unconditional use of a coaster brake. The performance of the silent and vibration free motor is 250 Watt nominal and can reach a maximum torque of 53Nm. By using the recuperation function the range can be extended. The production is located in Germany and patented worldwide. The torque read out occurs through a specifically developed sensor inner bearing, while a special AEG-eBike crank set to complete the disc motor set was also designed especially for the disc motor´s requirements. Due to the very small construction size the motor can be integrated into the rear wheel inconspicuously. By using a brand new, worldwide patented technology the motor reaches a performance of 250 Watt nominal and 50Nm maximum. The silent rear motor with integrated controller and torque measurement, waives a gear box and enables an extended range through a recuperation function. Two different 36V li-Ion batteries offer the possibility to choose between a carrier and a downtube battery version. By offerering these mount possibilities the battery system can be used for any type of bike, MTB/Cross, Trekking or City. 18650 brand cells, in different capacity variations, built the inner core of the batteries, mounted in Germany. a magnetic plug offers the option to charge directly on the bike or a removed battery. The integrated Mini-UsB interface enables easy software downloads without having to disassemble or open any components. an electronic connector for the automatic shifting system „NuVinci Harmony“ is already in place. The carrier battery is put on the carrier plate and therefore becomes a carrying element. To remain flexible, it is possible to mount a „racktime snapit“ adapter for baskets and bags on the battery. The maximum capacity amounts to 17ah (612Wh). Over a special mounting rail the downtube battery is mounted firmly and without play on the downtube. The end caps were beveled to enable the use of a ladies trapeze frame. The maximum capacity amounts to 11,6ah (417Wh). The exclusive AEG-eBike carrier was developed in cooperation with the experts from the German company „tubus“. It´s features include a clean look, light weight, slim construction height, by always focusing on high stability. In order to use carrier bags, the mount of side rails is possible. The trendy lCD-Display with smartphone look is placed centrally on the stem and therefore is always in sight of the rider. even in bad weather conditions it is clearly readable and increases riding safety. stiamo aspettando il momento di provarlo!